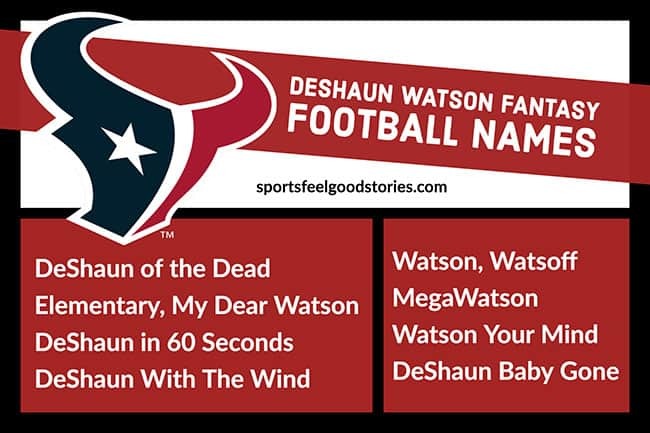 DeShaun Watson Fantasy Football Names are sure to energize your fantasy football season. Watson is an NFL star on the rise, with several NFL records to his name, including most passing touchdowns by a rookie in a 5-game span and first player in NFL history to pass for 400+ yards, 4+ touchdowns and 50+ rush yards in a single game. Watson was selected by the Houston Texans with the 12th pick in the first round of the 2017 NFL Draft. He played in all 16 games of his rookie year, averaging an NFL-best 6.1 yards per rushing attempt. As a dual-threat running back, he also averaged 10.2 yards per catch out of the backfield. In high school he earned the title of Georgia’s Mr. Football from the Atlanta Journal-Constitution. His full name is Derrick DeShaun Watson. When DeShaun was 11 year old, Atlanta Falcon’s running back Warrick Dunn’s charity, Homes for the Holidays, donated a home to the Watson family. Watson was the third quarterback taken in the 2017 NFL Draft (12th overall) after Mitchell Trubisky (Chicago Bears 2nd overall) and Patrick Mahomes II (Kansas City Chiefs 10th overall). Who’s on First, Watson Second. Watson attended Gainesville High School in Gainesville, Georgia. As a freshman he became the starting quarterback for the school’s football team. Over his high school career, he set records including total yards (17,134) touchdowns (218) passing yards (13.077) and passing touchdowns (155). After high school he went on to play football at Clemson University, where he led the team to a CFP championship game appearance in 2015 and followed that with a national championship the next year. It’s Always Darkest Before DeShaun.